According to the survey, the burning sun, reflection and distance light will seriously affect the binocular vision health and driving safety, nearly 36% of drivers with different degree of eyes disease.Does the sun hurt your eyes when you travel by day? Do car headlights blind you when you drive at night?Say goodbye to those hassles, just take your Car Visor home by Snorain today!UV-blocking, filtering the sunlight, let the light not too dazzling. When two car meet, scattering the high light and let the light become soft. To improve the resolution of the dark and fog days. Removing the snow-blind area, preventing dazzle. Eliminating eye fatigue, keeping focused and having a clear sight. Snorain items 100% have been strictly tested by the factory. If you are not completely satisfied, CONTACT US BEFORE REVIEW and we will provide a full refund or replace a new one for you!Specification:Size: 12.6 inches long and 4.33 inches tall. Thickness：2 mm.WHAT YOU GET: Anti-glare visor 1 User Manual 1 Lint-free cloth 1 HOW TO USE: 1. Please remove the protection films before using the product.2. The retractable toothed shank should be always on the top side. 3. When you hook the anti-glare visor with your original visor, the toothed shank side should be facing yourself.4. Use both of your hands to adjust the panels. WARM TIPS: 1. For a clear view, do not touch the mirror with your fingers. 2. Before use, please adjust the mirror to an angle that does not reflect the back-light. 3. Please make sure our visor dimension can support your vehicle before you order. 4. Not suitable for large vehicles such as bus trucks, etc. High QUALITY – The Snorain car anti-glare visor is made from Heat-resistant materials, very strong, safe and durable PP & TPR material to give maximum strength and durability for long lasting usage. ANTI-GLARE – Light-filtering technology to block excess glare and harmful UV rays. Drive safely on a bright, sunny day, or over snowy terrain which readily reflects back light. EYES COMFORT – Avoid sun glare stabbed shot to ease eyestrain. This is ideal for people who are more susceptible to glare. The visor relieves eye fatigue and effectively protects the safety of driving under the strong light. The car visor filters the armful light; reducing light pollution caused by eye diseases and protects the visual health. EASY TO INSTALL- Easy clip-on attachment. Say goodbye to cumbersome products that are difficult to install and one button to pull up products which are easy to lose control! The visors can be adjusted by rotating 180 degree to accommodate your needs. UNIVERSAL- Size: 12.6 inches * 4.33 inches. Thickness：2 mm. Compatible with all vehicles. The sun visor can also be kept easily in the storage when not in use. Once folded back into place, the space it takes up is minimal. Is the back seat of your car collecting trash? You can change that today with this high quality car trash bag. Avoid cheap trash bags that leak all over the interior of your car. 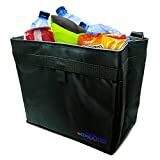 This trash bag is made with durable construction and quality materials for long-term use. A velcro closure will keep the bag closed. This bag is perfect for daily commuters as well as long vacations and road trips. The neutral color looks good with any interior and helps keep your car looking new. The large capacity can hold plenty of trash before emptying. By avoiding spills and messes, you save money on costly cleaning and detailing services. Imagine a clean car that looks beautiful and you are proud to show-off.